Every two years the North Jersey Section of the American Chemical Society presents the prestigious Leo Hendrik Baekeland Award to an exceptional younger chemist. The award consists of a gold medal and a $5,000 honorarium. It serves to commemorate the technical and industrial achievements of Leo Hendrik Baekeland and to encourage younger chemists to emulate his example. 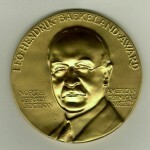 The Baekeland Medal is presented to the honoree at a Section-wide banquet and research symposium usually held in December of the award year.